Mondays are my favourites when they include some delicious food – cause let’s be honest: it makes getting up in the AM after a wonderful weekend so much easier, when you know there is some delicious food awaiting. 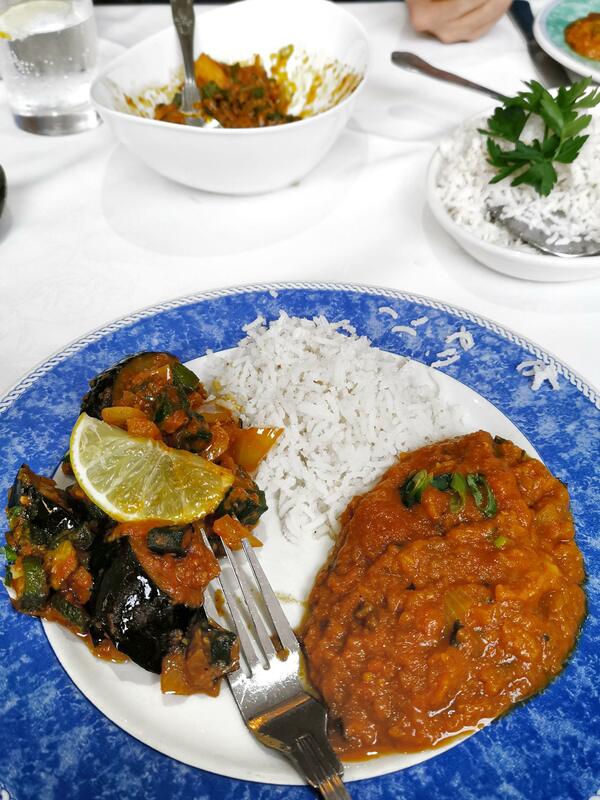 Last Monday was one of those wonderful ones – as I knew some delicious vegan food was coming up: I went to Cityspice on Brick Lane for the very first time to check out their vegan food offering. Located right in the heart of Brick Lane you definitely can’t miss this gem – I actually just walked past it a couple of days earlier when heading home from Vegan Nights (which is next door at the Truman Brewery). 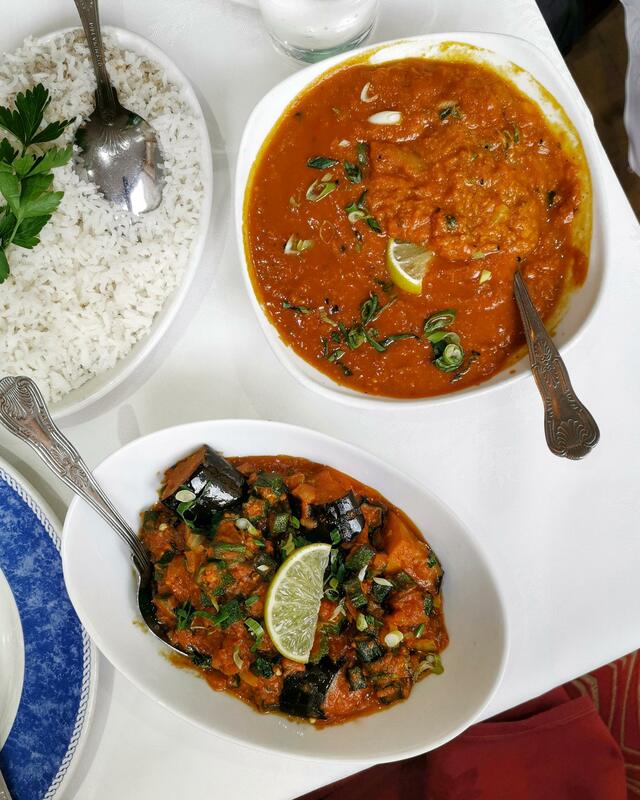 With their offering of traditional Bangladeshi & Indian cuisine, excited was an understatement and their curries are meant to be the best in all of London! After all, I love a good Indian meal, but I’m also only just learning and practicing to cook it right myself. Where I grew up there sadly wasn’t a big offering of Indian food, so I only just found this love in my 20s. 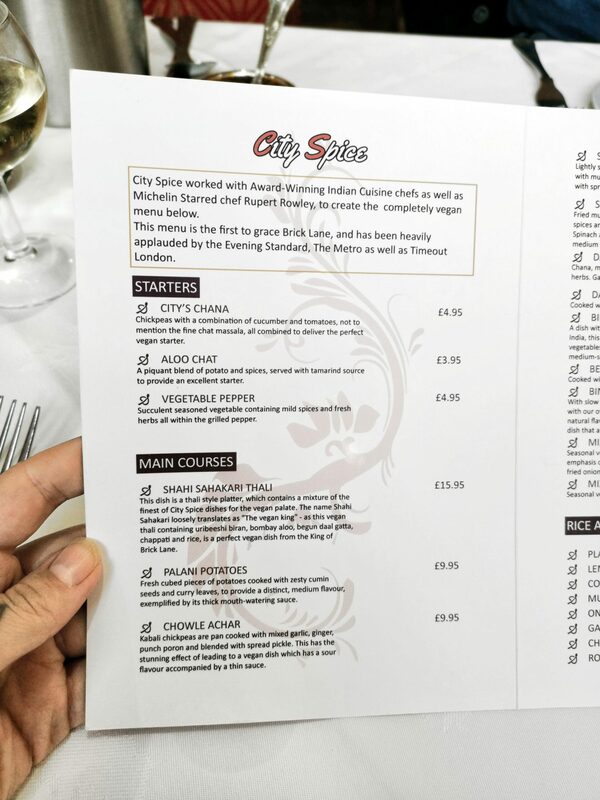 Cityspice‘s vegan menu is easy to overview – Starters, Mains and Sides, aka ‘Rice and Breads’ that can be served alongside a main dish. 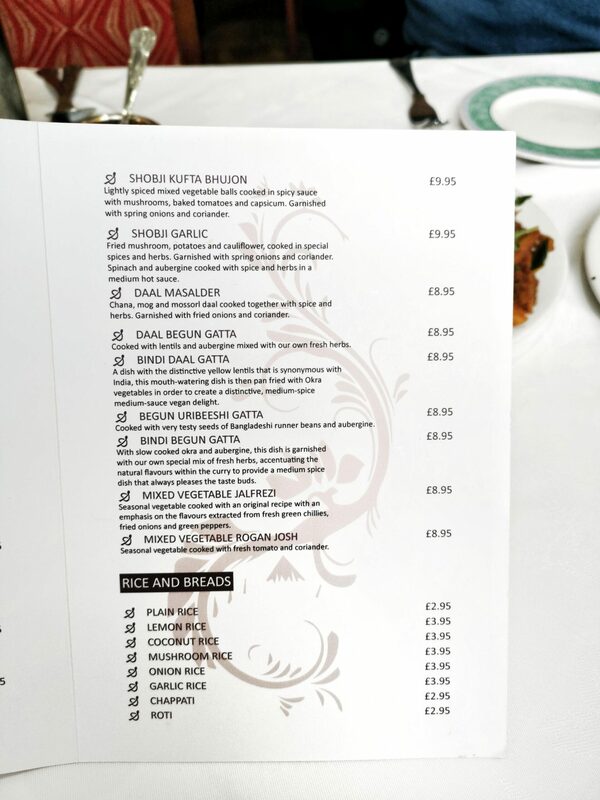 Besides having newspaper articles of their previous successes visible outside the restaurant, they also mention on their menu that they have collaborated with award-winning Indian Cuisine Chefs as well as Michelin starred chef Rupert Rowley to create their vegan menu. I was surprised to see a selection of vegan wines on their drinks menu – not something I get to see often at restaurants that are not fully vegan, but definitely a good surprise! They also had vegan white wine on the menu – we picked a South African one that came by the bottle and was deliciously light and fruity. Apart from their vegan wines also offers beers, soft drinks and lassi – alongside a selection or other wines. We started our little flavour excursion with some poppadoms and dips – the mango chutney was simply amazing – and you can believe me when I tell you that there was no drop of it left after this round! 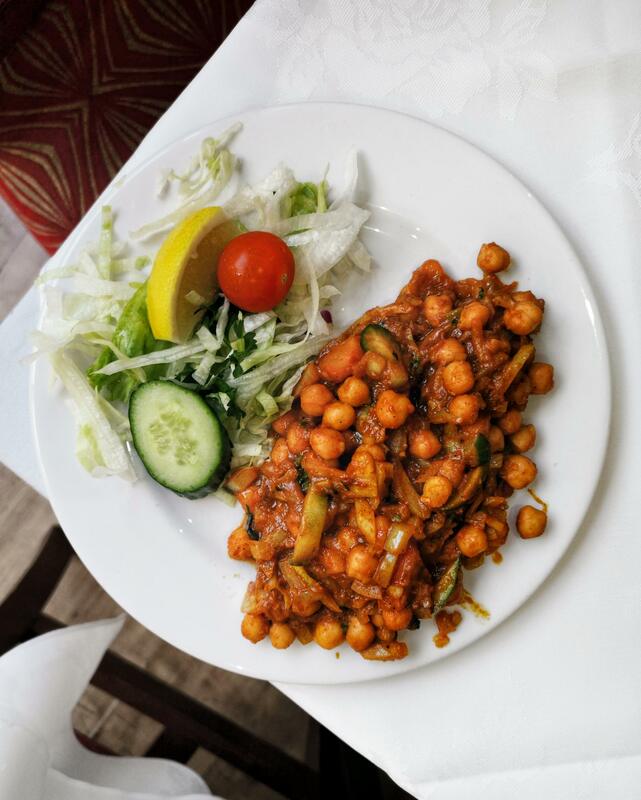 For our starters we chose the City’s Chana, which includes a combination of chickpeas, cucumber and tomato, and Aloo Chat, which is created with potatoes, spices and a tamarind sauce. 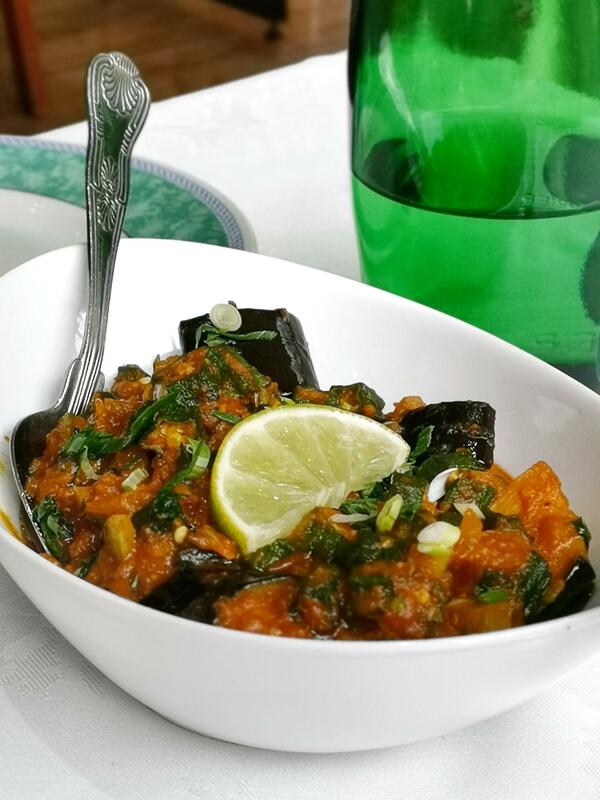 I have actually attempted to cook Aloo Chat before myself, and yes ‘attempted’ – because it didn’t get anywhere close to this Aloo Chat from Cityspice! 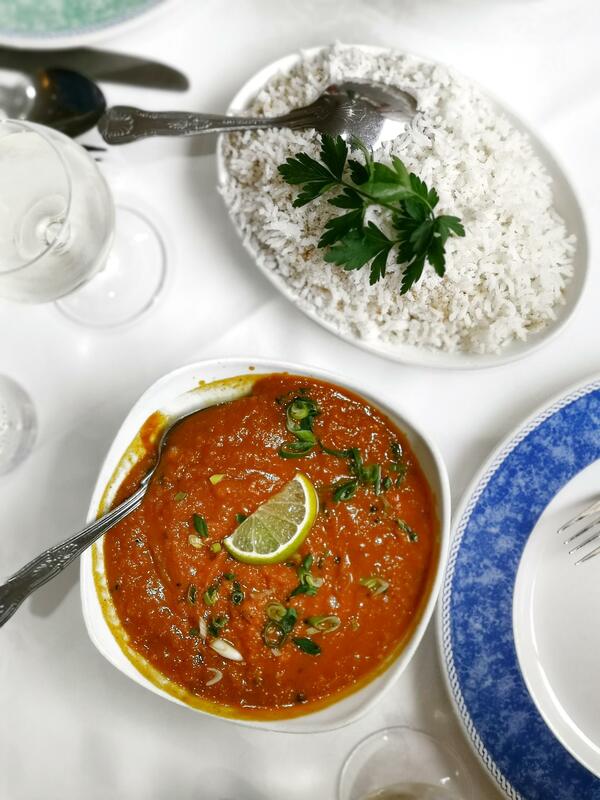 If I had to choose between the two, I would definitely go for the vegan Aloo Chat again next time – deliciously spicy and piquant, but again: not too spicy for a sensitive eater like myself. On to the Mains: It was difficult to decide which dishes to go for as they all sounded fantastic – and I honestly would’ve loved to try them all, but there’s only so much my stomach can handle within a day. I was lucky that my friend Paco joined me for the lunch meal (cause food together is better than food alone, right?!) – because I would not have been able to finish it all by myself, no matter how delicious it was. 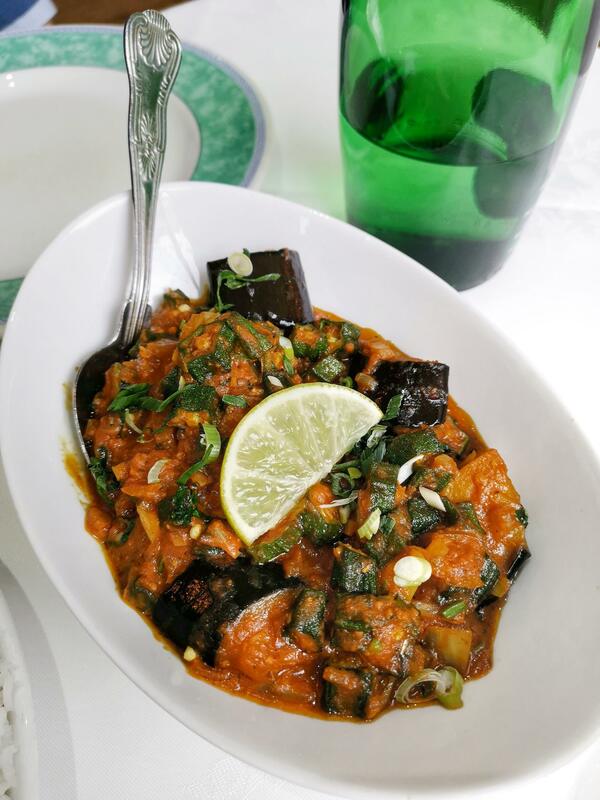 He chose the Bindi Begun Gatta, which is a curry including okra and aubergine with lots of fresh herbs added. 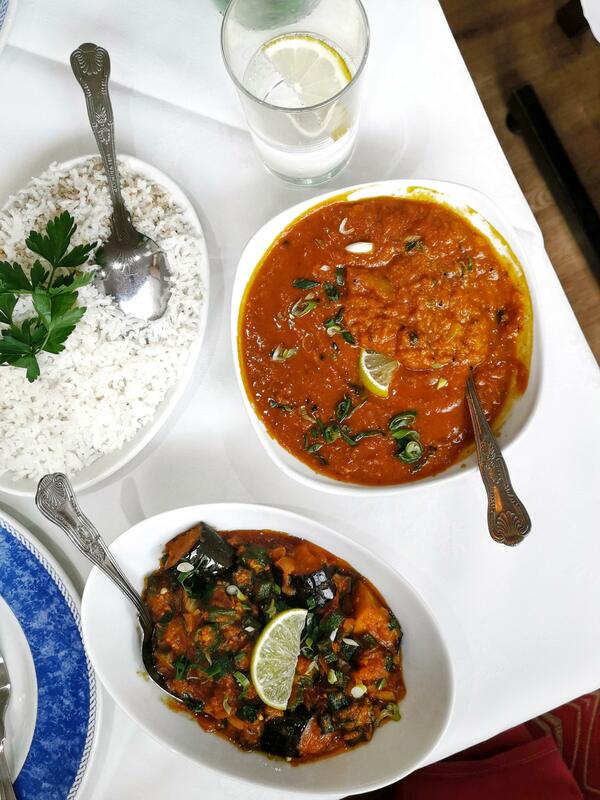 Both of the mains were absolutely scrumptious & full of flavour – and with the two dishes we chose we also had a great mixture of textures as the Daal is rather smooth, whilst the Bindi very chunky with the aubergine and okra. We ordered both dishes with a side of coconut rice, which worked very well alongside. 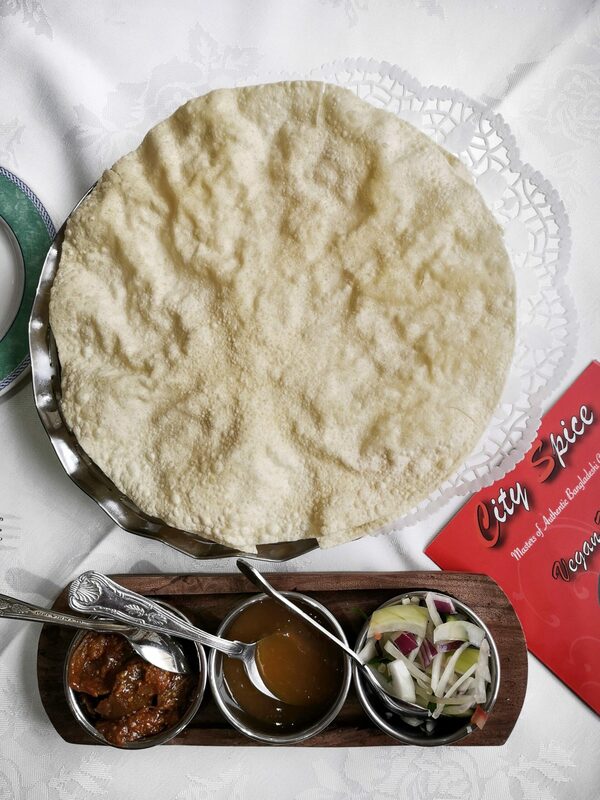 If you’re not much into coconut, Cityspice has got you covered with their offerings of Plain, Lemon, Mushroom, Onion and Garlic Rices – and if you’re not feeling like rice, you can also pair their curries with Chappati or Roti. 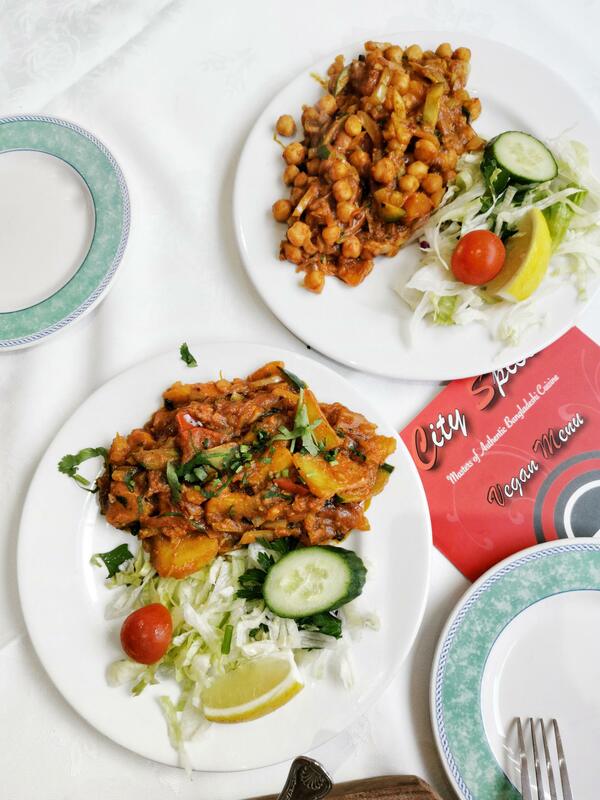 Cityspice is THE place to go to, if you’re after some delicious and authentic Indian cuisine in London – with their bespoke vegan menu, you don’t have to worry about what they put into the dishes – at least I have always felt that worry when I attempted to eat vegan Indian food at any place that didn’t mark their dishes as vegan before! It’s also perfect for taking your carnivore friends, as it’ll make their tastebuds happy also! Locationwise, it couldn’t be better: The nearest stations would be Shoreditch High Street (Overground), Aldgate East (District Line) or Liverpool Street (Overground, Rail, Hammersmith & City, Circle, Central & Metropolitan Lines), which is just a 10 minute walk down the road. 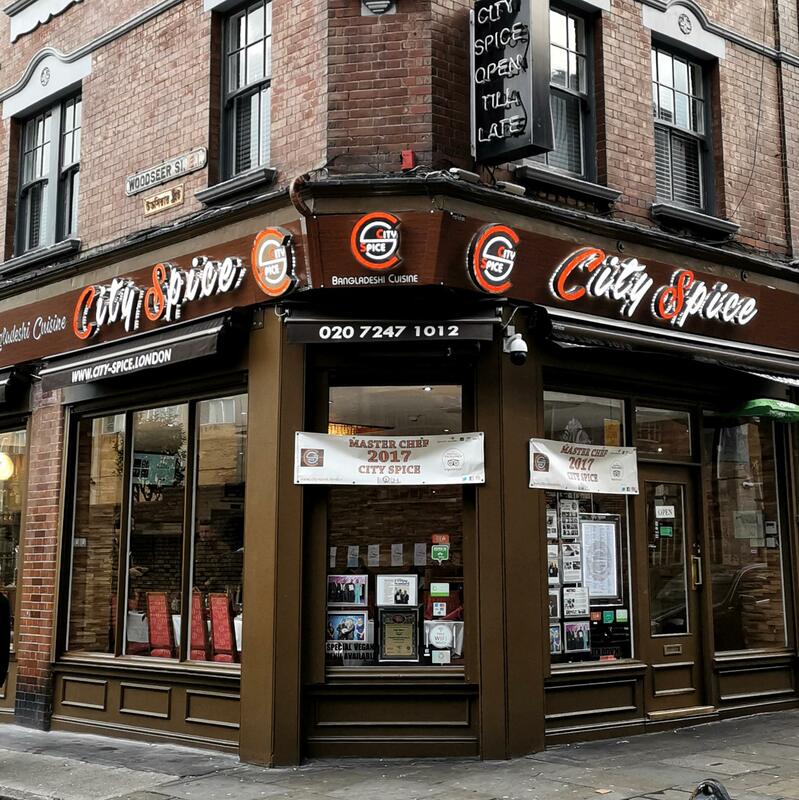 With lots of bars & places to go out to in the area around Brick Lane and Shoreditch, Cityspice is perfect for a delicious food option with friends on an eve out! In friendly collaboration with Cityspice.